▲Seahawks quarterback Russell Wilson (3) dives for a first down on a fourth-down run to pick up the first down in the fourth quarter. The Seattle Seahawks played the Los Angeles Chargers in a NFL football game at CenturyLink Field in Seattle, Wash., on Sunday, Nov. 4, 2018. 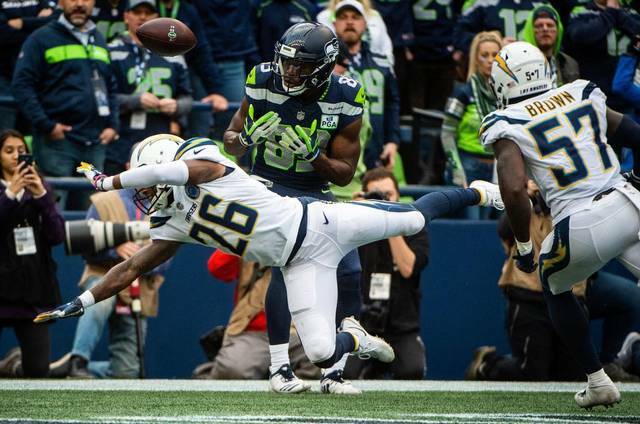 ▲Chargers corner back Casey Hayward Jr. (26) defends a pass in the end zone intended for Seahawks wide receiver David Moore (83) in the fourth quarter. The Seattle Seahawks played the Los Angeles Chargers in a NFL football game at CenturyLink Field in Seattle, Wash., on Sunday, Nov. 4, 2018. 시애틀, 워싱턴- 시애틀 시혹스(NFC-서부조, 4-4)가 4일(현지 시간) 6만8,574명의 관중이 지켜보는 가운데 홈구장 센추리링크 필드에서 벌어진 美전국풋볼리그 9주차 LA차저스(AFC-서부조,6-2)와의 경기에서 17:25로 패했다. 시혹스는 1쿼터 6:55 상황에서 QB 러셀 윌슨의 10야드 패싱 볼을 잡은 WR 재론 브라운이 터치다운을 성공시키면서 7:0으로 선취점을 올렸다. 그러나 곧 반격에 나선 차저스의 QB 필립 리버스가 12야드 패싱한 볼을 RB 멜빌 고덴이 터치다운으로 연결시키면서 7:6, 1점차로 쿼터를 마감했다. 2쿼터부터 시혹스의 수비력이 차저스의 공격 앞에 무너지기 시작했다. 시혹스는 11;36 상황에서 1쿼터에서 터치다운을 기록한 차저스 RB 멜빌 고덴에 두 번 째 터치다운을 내주었고, 이어 쿼터 종료 1:10에는 차저스 WR 마이크 윌리암스에게 또 다시 터치다운을 허용하는 바람에 7:19로 리드 당하기 시작했다. 시혹스도 포기하지 않고 공격을 감행한 끝에 44야드에서 얻은 필드골을 PK 세배스티안 제이니코우스키가 성공시켜 10:19로 쿼터를 끝냈다. 양팀은 3쿼터에서 득점 없는 경기를 펼친 후 벌어진 4쿼터에서 시혹스는 경기 종료 6:44를 남기고 차저스 CB 데몬드 킹에게 인터셉트를 허용하는 바람에 10:25로 경기를 뒤집을 수 있는 기회를 놓쳤다. 시혹스는 4쿼터 종료 1:50초를 남기고 QB 러셀 윌슨이 패싱한 볼을 TE 닉 배넷이 터치다운을 성공시켰으나 17:25로 점수차를 좁히는데 그쳤다. 시혹스는 11일 같은 조 NFC-서부조 선두를 달리는 LA 램즈와 원정 경기를 갖는다. 시혹스는 4승4패로 램즈에 이어 2위를 달리고 있다. 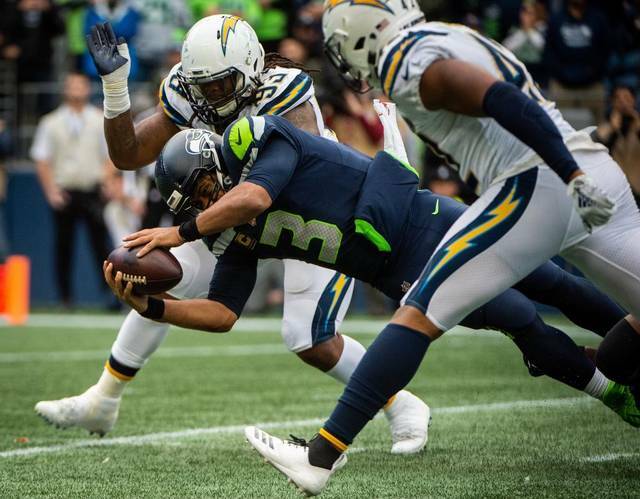 ▲Chargers safety Jahleel Addae (37) chases down Seahawks quarterback Russell Wilson for a sack in the second quarter. The Seattle Seahawks played the Los Angeles Chargers in a NFL football game at CenturyLink Field in Seattle, Wash., on Sunday, Nov. 4, 2018. 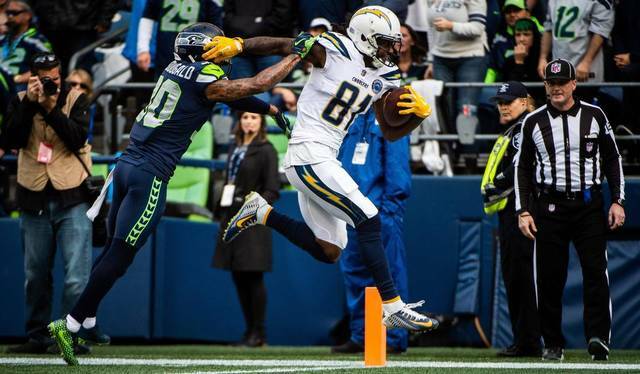 ▲Chargers wide receiver Mike Williams (81) fights off Seahawks safety Bradley McDougald (30) for a touchdown in the second quarter. 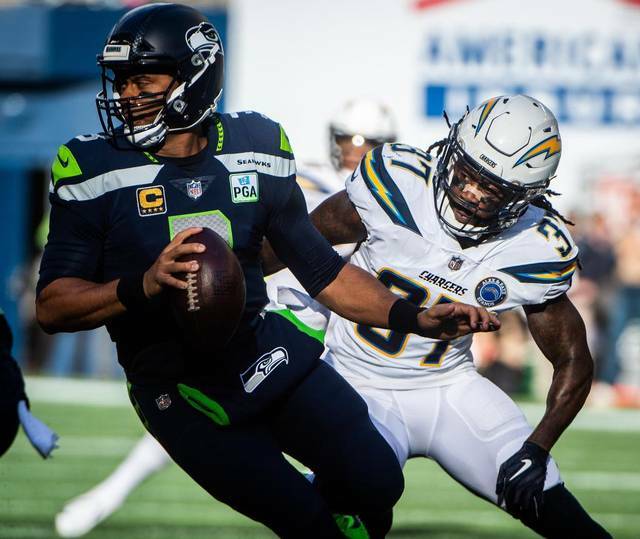 The Seattle Seahawks played the Los Angeles Chargers in a NFL football game at CenturyLink Field in Seattle, Wash., on Sunday, Nov. 4, 2018.